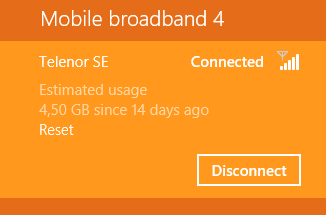 The mobile broadband support is just excellent in Windows 8, possible to set a metered/non-metered connection and configure the connection send/recieve less information. Also applications can take use this, for example in Outlook Preview 2013 you get a message like this if you use metered connection to save bandwidth (and money). And it’s really user friendly, just plug in the 4G dongle, the device will initialize and will automatically connect to the network, no more pin and press connect (if you dont want to). The status and mobile broadband is shown in the same interface as normal wi-fi which makes it really easy to find and use. With a description: “Service for runing Mobile applications autorun.” from the vendor. I put the service to manual and stopped it, now it works as a charm and without any popups!